WiMIR is a group of people within the International Society for Music Information Retrieval. We are dedicated to promoting the role of, and increasing opportunities for, women in the MIR field. We meet to socialize, share information, and discuss in an informal setting, with the goal of building a community around women in our field. If you have exciting new ideas for WiMIR events or would like to get involved in discussions and organization of existing events, join our group! WiMIR has held an annual meeting at the ISMIR conference since 2012, the very first meeting has been initiated by Ching-Hua Chuan (University of North Florida, USA) at ISMIR 2011 in Miami. A number of important issues ranging from mentorship, conference support, to improving the representativeness of women researchers in the community were discussed. The meetings have had a high turnout of both female and male attendees. 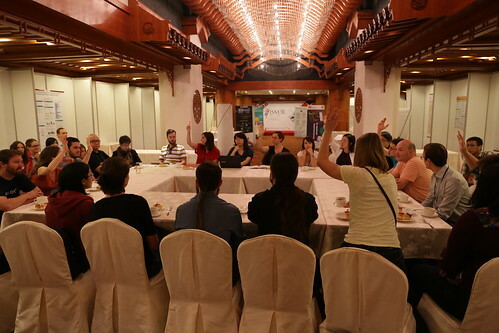 Photos from the WiMIR meeting at ISMIR 2014 can be viewed on Flickr (scroll to the right, apologies for the adverts), chaired by Jin Ha Lee (University of Washington, USA). The WiMIR session was included in the conference program itself for the very first time at ISMIR 2015, resulting in a productive and successful session. The high turnout of participants can be noticed in the photos. The slides presented at the meeting are available here. Since 2016. ismir conference committees include wimir representatives. At ISMIR 2016, the conference committee included two wimir representative: Amélie Anglade (MIR Consultant, Germany) and Blair Kaneshiro (Stanford University, USA). The WiMIR session at ISMIR 2016 presented the outcomes of the first round of the mentoring program, and further plans on outreach to other communities. For the very first time, Amazon music sponsored a reception to celebrate the WiMIR mentoring program. At ISMIR 2017 conference, WiMIR representatives are Jin Ha Lee (University of Washington, USA), Preeti Rao (Indian Institute of Technology Bombay, India) and Zhongzhe Xiao (Soochow University, Mainland China). Please contact them for exciting new ideas for 2017.